Acares Midget Reef Chromis is a species of popular aquarium fish. The Acares Midget Reef Chromis is part of the Chromiae subfamily, the Pomacentridae genera. Chromis is the largest genus in the Pomacentridae group with 86 known species. The Chromis group is widely distributed in warm and sub-tropical waters around the world. Acares Midget Reef Chromis , sometimes called Chromis acares, are a reef-compatible fish that add a brilliant gold and blue coloring to your fish tank. Native to Fiji, this salt-water species has some color variations from blue to orange to yellow to tan. They grow to be up to two inches long. Males tend to be larger than females, though not by much. Acares Midget Reef Chromis need a tank that is at least 30 gallons in capacity. They are semi-aggressive, territorial toward similarly sized fish of the same species and other species. 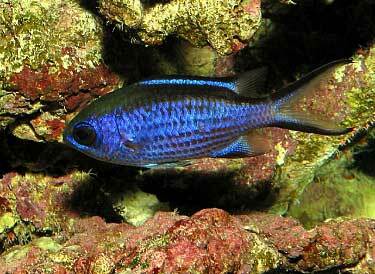 Chromis fish will ignore crustaceans, but they cannot share a tank with anglers or frogs. Use caution if putting them in a tank with batfish. They are omnivores. They should be fed a mixture of meaty items like blood worms, herbivore fish flakes, frozen brine shrimp and sometimes vitamin enriched supplements to maintain their vivid colors. Acares Midget Reef Chromis need water that is 72 to 78 degrees Fahrenheit. They do best in water with a pH of 8.1 to 8.4. Water hardness should be between 1.020 and 1.025. The Acares Midget Reef Chromis should be kept in a tank with plenty of hiding places. Their default reaction to potential threats is to seek a hiding place. Juvenile chromis may school, but adults are mostly solitary. Adults tend to have a territory of a few square feet, with males seeking to control several females. When mating, the males Acares Midget Reef Chromis create a nesting site. They use their pectoral fans to blow away debris, something most fish use their caudal fins to do. They have simple mating rituals where the male has several vertical bursts to gain the female’s attention. He lets the female attach her eggs to a rock or plant before fertilizing them.